FELTING matters... : "Felting for Fun…"
popular and previous feltmaking experience isn't necessary. 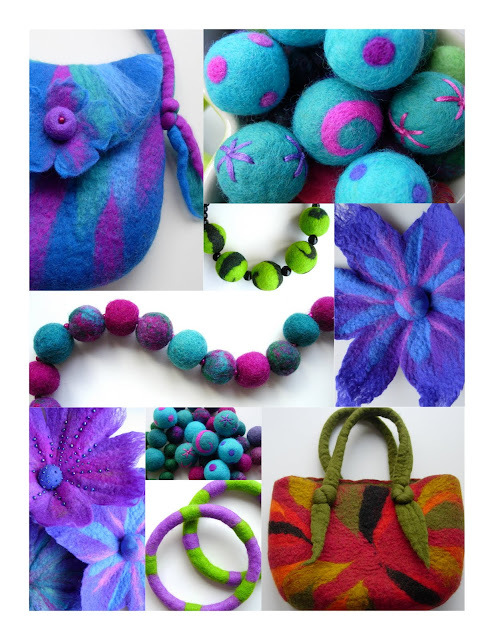 "FELT JEWELLERY" : Thursday 16th June & Thursday 7th July. Creating felt flowers brooches & corsages - perfect for those summer weddings! Making felt beads & bangles using a variety of simple felting techniques, with lots of ideas for decoration using needle felting, beads & embroidery. Click here for more Felt Jewellery photos & information. The workshops will run from 10am through to 4pm and be held in the Freshwater Gallery at Dimbola, a lovely spacious room that used to be Julia Margaret Cameron's dining room. So we can work in the knowledge that the likes of Tennyson, Darwin & Thackery once shared this historic room with us. Merino Tops Fibre Packs… UPDATE!